You are here: Home / All blog posts / KITS ARE HERE! Hey Every­body! Kits spe­cially designed for The Ricks Bead­ing Loom are here! They are called “LOOMAKITS” and dis­trib­uted exclu­sively by The Bead­Smith (Helby Import Co.). They are in easy-open plas­tic “blis­ter boxes”. 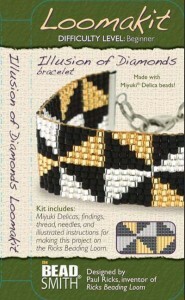 Look for these kits in your local bead shop and if you don’t see them, ask the owner to order them for you. There are cur­rently four kits avail­able. The kits will include not only detailed, illus­trated instruc­tions for mak­ing the projects, but also EVERYTHING needed to com­plete it! This includes the beads, thread, nee­dles and clasp com­po­nents. The “Glit­ter­ing Crys­tals”, “Wizzo” and “Illu­sion of Dia­monds” kits even include the nifty “Miyuki Slide Tubes” for the ends of the projects giv­ing them a VERY pro­fes­sional look! I think you’re going to like these kits. The first is called “Desert Fire” which is a south­west­ern style pat­tern pat­terned after the style of the Hopi and Zuni peo­ples of North­ern Ari­zona, Utah, New Mex­ico and Col­orado. This is a very col­or­ful pat­tern which reminds me of my win­ter home in Casa Grande, Ari­zona. This pat­tern has a dif­fi­culty level of “High Beginner”. The next pat­tern is called “Illu­sion of Dia­monds” and has an illu­sory visual effect in that some­times it looks like a dia­mond pat­tern and if you look away then look back it looks like a pin­wheel pat­tern. I was inspired to design this pat­tern when my wife and I stopped at a road­side restau­rant in Idaho for lunch. I looked at the pat­tern of the uphol­stery of the booth we were sit­ting in and thought “hmm…bead pat­tern?” That night I worked it up and it’s been very pop­u­lar. The dif­fi­culty level for this one is also “High Beginner”. 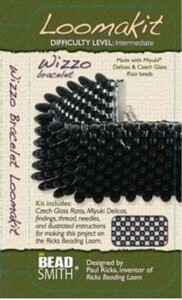 The third one is the “Wizzo Bracelet” and uses the rel­a­tively new “Rizo” beads and size 11 Del­ica beads. It sort of reminds me of either a cater­pil­lar (the insect, not the bull­dozer!) or a furry lit­tle crit­ter! The beads included in this kit are Opaque Black Rizo beads and Sil­ver Lined Sil­ver Del­i­cas but the pat­tern looks great with any con­trast­ing col­ors — I espe­cially like using Opaque Black Del­i­cas and Opaque White Rizos! The dif­fi­culty level for this kit is “Intermediate”. 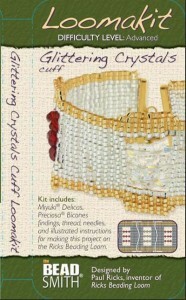 The fourth kit is the “Glit­ter­ing Crys­tals” kit. This kit fea­tures two col­ors of Del­ica Beads (Sil­ver and Gold) and two col­ors of Pre­ciosa 4mm bicone crys­tals (Siam and Clear). The kit is des­ig­nated as an “Advanced Level” project in that not only are you doing straight, flat loom­ing, but you string the crys­tals on the warp thread before warp­ing the loom and then use the square stitch tech­nique (instruc­tions on this tech­nique included) for edge embellishment. As you can tell, I’m very excited about the release of these kits which have been in devel­op­ment for almost eigh­teen months. Now that we have the pro­ce­dure down and the glitches in pro­duc­tion worked out look for another twelve kits to be released in the com­ing months! Thanks for all the sup­port out there from my loyal “LOOMATIKS”! I want to start a Loomatiks group at my shop! I have been try­ing to get a mes­sage to you, but the sys­tem will not allow me to do this. Can you please con­tact me with info about set­ting up an offi­cial group!